Would God really want to take credit for the mosquito? Natural theology, which reigned before Charles Darwin introduced his theory of evolution, argued that creation demonstrated the power, wisdom, and goodness of God. But what about nature’s evils? Consider for example the ichneumonoidea, wasps that inject their eggs into a host insect. They also inject a chemical that paralyzes the host without killing it. Aside from providing an incubator for the wasp’s eggs, the host also becomes the first meal for the newly hatched wasp, which carefully consumes the host so as to keep it alive a long as possible. As is so often observed in nature, profound levels of evil are accompanied by profound levels of complexity. Evil, it turns out, is not always banal. In this strange and apparently cruel operation one circumstance is truly remarkable. The larva of the Ichneumon, though every day, perhaps for months, it gnaws the inside of the caterpillar, and though at last it has devoured almost every part of it except the skin and intestines, carefully all this time it avoids injuring the vital organs, as if aware that its own existence depends on that of the insect upon which it preys! But Kirby’s views were not shared by those who felt god would never create such a horrifying world. Centuries earlier Thomas Burnett, Ralph Cudworth, John Ray and others had called for a distancing of God at the sight of far less wrenching evils. Imagine what their response would have been to nature’s new round of atrocities being uncovered by science. I own that I cannot see as plainly as others do, and as I should wish to do, evidence of design and beneficence on all sides of us. There seems to me too much misery in the world. I cannot persuade myself that a beneficent and omnipotent God would have designedly created the Ichneumonidae with the express intention of their feeding within the living bodies of caterpillars, or the cat should play with mice. Science and religion were “thoroughly interwoven in Darwin’s life and thought,” but this was hardly unique to Darwin. It is not surprising that many theologians gave a warm welcome to Darwin’s theory. Nor is it surprising that Darwin’s theory would lend itself to a new round of theological naturalism. Theological naturalism had argued for a distancing of the Creator from creation. Now Darwin’s theory was filling in the details. It was natural selection, not a divine finger, that did the job. Darwin’s idea provided a new framework for continued theological speculation. More disgusting than the parasitic wasp is the mosquito, which brings misery and death to hundreds of millions of people every year. As evolutionist Ken Miller rhetorically asks, would god really want to take credit for the mosquito? Of course if Burnett, Darwin, Miller and the rest don’t believe god would create such evils, then evolution must be true, one way or another. But like the parasitic wasp, the mosquito is complex. For instance, a few years ago Chinese researchers discovered that mosquitoes have an amazing ability to land, walk and take-off from water. Of course mosquitoes are not the only insect that can move about on the water’s surface, but the buoyancy of a mosquito’s leg—about 23 times the mosquito’s body weight—and its nanostructures are remarkable. Blood-feeding insects also have exquisitely designed carbon dioxide sensors to home in on their prey. Research has identified two dedicated neural receptors that together cause nerve signals to be sent when carbon dioxide is present. The experiments found that the presence of both receptors is required—either one alone failed to sense the carbon dioxide. Given such an exquisite design, and given that both receptors are required because a single receptor working alone is ineffective, one might think that evolutionists might struggle to explain this engineering marvel. But evolutionists have no such problem. After all, would god really want to take credit for the mosquito? After all, would god really want to take credit for the mosquito? "But Grandmother! What big ears you have," said Little Red Riding Hood as she edged closer to the bed. "The better to hear you with, my dear," replied the wolf. "But Grandmother! What big eyes you have," said Little Red Riding Hood. "The better to see you with, my dear," replied the wolf. "But Grandmother! What big teeth you have," said Little Red Riding Hood her voice quivering slightly. "After all, would god really want to take credit for the mosquito? "The better to eat you with, my dear…"
This is entertainment at it's funniest. Look who predictably showed up first stomping, sulking and pouting. Cornelius must really get under your skin!!! Let us not forget my favorite: the emerald cockroach wasp. The wasp stings a cockroach twice. The first sting in the thoracic ganglion mildly paralyzes the front two legs of the cockroach. The second sting is in a precisely chosen spot in the head ganglion (brain) that disables the escape reflex. The wasp, which is too small too carry the cockroach, then uses one of the cockroach's antennae much as a leash and guides the cockroach to its borough. The wasp lays its egg on the abdomen of the cockroach, which is resting quietly. When the egg hatches, the larva chews into the abdomen and begins eating the internal organs. The organs are eaten in an order that keeps the cockroach alive until the larva enters the pupal stage. The cocoon is formed inside the body and soon the adult wasp will emerge. The question I have struggled with is this. Do we impose our views on how nature should work based on our understanding of God, or does our understanding of God change based on how nature does work? Does the answer to this question suggest that the designer of nature may not be God? That might be a good argument if lots of people accepted evolution because they thought "Well, I guess God wouldn't do it that way," rather than because the independent lines of consilient evidence from essentially every single scientific discipline indicate that descent with modification via natural selection acting on random mutations Is by far the best explanation for the state of life as we have it today. Those are good questions, but they are theological ones, not scientific. Science can only examine and catalog the natural world, then report back what it finds. Another question I've never gotten an answer to from any 'Design' advocate is why are there so many predator/prey relationships, where one species is doing its level best to kill and eat every last member of another species. Does that mean there were actually at least two Designers, working at cross purposes? How does Design explain the observed predator/prey "arms races", where one species will evolve a deadly method of attack (say a potent toxin) and another will evolve a defense (resistance to the toxin) against it? "Can any relation be more simple, yet more convincing, than this, that the eyes are so placed as to look in the direction in which the legs move and the hands work? It might have happened very differently, if it had been left to chance. There were, at least, three quarters of the compass out of four to have erred in. Any considerable alteration in the position of the eye, or the figure of the joints, would have disturbed the line, and destroyed the alliance between the sense and the limbs." Cue the old joke about we must be designed, because how lucky would it be that our legs are the exact length they need to be to keep our butts from scraping the ground? Cornelius is spot on. Theodicy is a real philosophical and theological issue worth exploring and discussing on a serious level; however, the Problem of Evil is for the theist to grapple with as it has no bearing on whether or not evolution is true. To use it as an argument for Darwinism is foolish in the extreme. Whenever we see instances of seemingly senseless and wanton cruelty in nature, we must remind ourselves that The Lord works in mysterious ways, and then try and reflect on the many great miracles of His creation. Meanwhile, back in the field and in the lab, evolutionists struggle to understand the mosquito. They sequence its DNA, study its behaviour, analyze the variations between and within populations, all in an effort to try and understand how this amazing creature functions. Agreed. Good thing that's just Cornelius' silly strawman, and that no researcher anywhere ever published in the primary scientific literature that the ToE is correct because God wouldn't create evil. What if the purpose of living things, our experiences, and stuff that happens is as varied and complex in its explanations as creation itself? Man is drawn to simple, one answer solutions and resolutions. Such is not the case with understanding the working of living organisms, the living cell, dna, physics, etc. Diving into the living cell unveils increasing levels of complexity unimagined by evolutionists in Darwin's time (and even today). Why should we always expect simple answers to things like why mosquitoes were created? 1. What roles do they play in the ecosystem? 2. If they no longer existed, how would that effect the ecosystems? 3. What role has man played in creating unbalanced ecosystems that make mosquitos more widespread? 4. What has been the role of man in creating unsanitary conditions for dangerous disease to originate and spread via mosquitos? 5. What role does the mosquito play in giving citronella candle makers a reason to exist and provide gainful employment? 6. Have mosquito's discouraged human development in some wetlands and other wildlife areas? Has that been beneficial to these areas? 7. Why do tropical areas in developed countries not face the ravages of malaria like other places? 8. What can we learn from mosquitos in the field of biomicry that would benefit mankind? What is bad for the spider is good for the wasp. So who's to say what is really good or bad? "We hope to have answer for you someday soon" is a perfectly acceptable answer for naturalists when discussing things like the origin of life. So why can't a theist answer "When the Eschatological Era arrives we will answer all the question about evil wasps and mosquitoes?" natschuster: "What is bad for the spider is good for the wasp. So who's to say what is really good or bad?" What is bad for the Tutsis is good for the Hutus. What is bad for the slave is good for the cotton farmer. So who's to say what is really good or bad? Well, so much for your moral high ground, nat. What's good for the woman, is bad for the man! You don't see the BULL or the DOG paying alimony! natshuster "We hope to have answer for you someday soon" is a perfectly acceptable answer for naturalists when discussing things like the origin of life. So why can't a theist answer "When the Eschatological Era arrives we will answer all the question about evil wasps and mosquitoes?" The reason is because "You'll know after you die," isn't quiiiite the same kind of response as: "We've got active research programs working on this, and looking at the pattern of knowledge increase over the last few centuries, we can make reasonable expectations that we'll know more about this subject in 10 years than we do now, and more in 20 than in 10." And if by "eschatological era" you mean the events described in the Olivet Discourse and the Book of Revelation, what makes you think that period is in the future? natshuster: "We hope to have answer for you someday soon" is a perfectly acceptable answer for naturalists when discussing things like the origin of life. So why can't a theist answer "When the Eschatological Era arrives we will answer all the question about evil wasps and mosquitoes?" And, because "We're working on an answer," is different than "We're waiting on an answer to be delivered supernaturally." Derick said, "What is bad for the Tutsis is good for the Hutus"
Are you equating humans with insects? Have you been watching too many Disney movies lately or what? Neal said: "Are you equating humans with insects? Have you been watching too many Disney movies lately or what?" Oh, suffering is only 'bad' if it's a human suffering, right? Is that what you're saying Neal? People are beginning to talk! And by the way Neal, where'd we end up with the iPod nested hierarchy thing? Did you ever finish that? Or were iPods a bad example? Derick, since you didn't give a direct answer would you be willing to go on record then as equating insect parasitism with the genocide? [He asked him further:] Whence do we know that a naked man must not separate [terumah]? — From the verse, That He see no unclean thing in thee.1 Said he [Rabbah] to him: Art thou not a priest:2 why then dost thou stand in a cemetery?3 — He replied: Has the Master not studied the laws of purity?4 For it has been taught: R. Simeon b. Yohai said: The graves of Gentiles do not defile, for it is written, And ye my flock, the flock of my pastures, are men;5 only ye are designated 'men'.6 — He replied: I cannot even adequately study the four [orders]; can I then study six?7 And why? he inquired. — I am too hard-pressed,8 he answered. He then led him into Paradise and said to him: Remove thy robe and collect and take away some of these leaves. So he gathered them and carried them off. As he was coming out, he heard a remark, 'Who would so consume his [portion in] the world [to come] as Rabbah b. Abbuha has done?' Thereupon he scattered and threw them away. Yet even so, since he had carried them in his robe, it had absorbed their fragrance, and so he sold it for twelve thousand denarii, which he distributed among his sons-in-law. Am I equating human genocide with insect parasitism? No. Am I pointing out the absurdity of the statement "So who's to say what is really good or bad?" in trying sweep the problem of suffering under the rug? Yes. Derick, the ipod discussion ended because you apply selection criteria to agree or disagree with whatever outcome you want. If biologists were as disagreeable about the classification of organisms, no classification system would be possible. With living organisms, how they are classified depends on agreeing to a set of selection criteria first. From a set of selection criteria, then a best fit nested hierarchy can be made. Somehow Zachriel and you were under the false idea that only one selection criteria (based on morphology I suppose) was available to form your "objective" nested hierarchy. However, a different classification based on genome sequencing, often conflicts with morphology. Sea Squirt for example. Even now Zachriel while not dispensing with his nested hierachy refrain altogether, now qualifies it with "exceptions". The pattern that is emerging with more and more genome sequencing is a pattern of typology and not common descent. 1. Can iPods be classified into a single, best fit nested hierarchy based on a panoply of traits? 2. If yes, what is that hierarchy? 3. Is suffering irrelevant or not 'bad' if it is something other than a human who is experiencing it? Derick said, "Now answer mine: Is suffering irrelevant or 'not' bad if it is something other than a human who is experiencing it?" Bad or evil? There is a difference. I think cold summers are bad, but they are not evil. Hitting a rabbit on the highway is bad for the rabbit, but would you say it's evil? It's good for the birds that come and eat the rabbit. Do you think its bad to vaccum your house to remove microbes from your carpet? In an ecosystem is it better for an insect to be eaten by predators or for their population to escalate to the point where they eat all the available food and the whole species goes into extinction and ecosystem collapses? Is it possible to build a sustainable ecosystem, given the physics of our world, where creatures are reproducing and where you do not have death and predators and prey? Is it evil for some to sacrifice their lives for the well being of the whole species? Is human suffering ALWAYS evil or bad? Can it sometimes be a learning experience? Do we sometimes become better off or better people through suffering? From a Christian perspective of eternity and the refining process, do you feel suffering is good, bad or inrrelevant? If the terms goodness, power, knowledge and design in the case of God cannot be used to explain God's behavior, or lack there of, then exactly what does the term design tell us, if anything, about the end results? Things turned out the way God wanted? But who's to say that design, in the case of God, means things actually turned out the way God wanted at all? After all, If the term goodness in the case of God tells us nothing about what God would or would not do, then how can the term 'design' in the case of God tell us anything about the biological complexity we observe? Rather than present an explanation, you're appealing to the fact that we cannot know with 100% certainty that such a being does not exist. Of course, it might be that up is down, good is evil, hot is cold, and darkness is light in the case of God as well. Who's to say? Despite our inability to rules this out, this doesn't prevent us from pointing out a claim that "God did it" is a non-explanation, which is indefensible for anything in particular. It's unclear why theists present explanation-less theories, then complain when they are not taken seriously by science as explanations for phenomena we observe. Scott, "evolution-did-it" is a non-explanation. Evolution is a superstition wrapped in scientific sounding buzz words that have little actual explanatory value. The mechanisms of evolution are insufficient in their explanatory value and unrealistic in the powers that they credit nature with. Evolutionists have a whole tool kit of buzz words that fall short of adding real value to the discuss. So people have a choice to put their faith in God as an intelligent creator or in natural processes that we know can't do what you suppose it must have done. A choice between accepting design for that which looks designed, or rejecting what looks designed without have a real explanation as to why it should be rejected as actually designed. Tedford, "god-did-it" is a non-explanation. God is a superstition wrapped in scientific sounding buzz words that have little actual explanatory value. The mechanisms of god are insufficient in their explanatory value and unrealistic in the powers that they credit their imaginary pseudo-human with. Tedford, if the ToE is as horribly wrong as you claim, why does the National Center for Disease Control (CDC) use evolutionary models to successfully predict and plan for the future genetic pathways of infectious diseases? Look at the bottom line Tedford: evolutionary theory works, your hot air dissipates in the breeze. Evolution is a superstition wrapped in scientific sounding buzz words that have little actual explanatory value. Not so Neal. The mechanisms of evolution are well studied and verified. There have been numerous research programs that have verified that natural selection is a real process that occurs in nature (e.g. the Grant's meticulous study of Galapagos finches). There have been many studies confirming the importance of genetic mutation as the source of variation upon which natural selection acts** (e.g. Lenski's ongoing research with E. coli). You may not consider these convincing evidence of evolution but they are hardly "buzz words" that have "little explanatory value". It's unfortunate but true that speciation takes a very, very, very long time. So long in fact that we must resort to secondary evidence to solve its cause. ** I realize that "upon which natural selection acts" is sloppy and anthropomorphic terminology but as I mentioned in a previous comment, sometimes anthropomorphic terminology provides a convenient short-hand for an otherwise lengthy explanation. Neal Tedford: Evolution is a superstition wrapped in scientific sounding buzz words that have little actual explanatory value. The mechanisms of evolution are insufficient in their explanatory value and unrealistic in the powers that they credit nature with. Isn't the high correlation between education and acceptance of evolution a little odd? It's almost as if the more people learn about the subject, the more likely the are to accept it. I guess education is a bad thing, a temptation from the devil, perhaps. Maybe they're just being brainwashed in institutions of higher learning, and it's a happy accident that they are able to so effectively add to mankind's body of knowledge. Neal Tedford: So people have a choice to put their faith in God as an intelligent creator or in natural processes that we know can't do what you suppose it must have done. Of course, God could never have used a natural process to accomplish a task, could He? God's sovereignty and omnipotence don't cover natural processes, I guess. And of course, your knowledge of natural laws is so exhaustive that not only do you know what natural laws can accomplish, but what they can't as well. I suppose it's just a sign of you humility that you haven't collected your pile of Nobel Prizes just yet. Neal: Scott, "evolution-did-it" is a non-explanation. In what context? The way you constantly attempt to conflate evolution with abiogenesis or physics, it's seems clear you're trying to explain something merely tangential to evolutionary theory, like how all life fits into your particular theodicy. But this isn't the question evolution is asking. The existence of any sort of biological complexity is not the same question as the details of the biological complexity itself. Why do both great apes and human beings have five fingers? Why have over 98% of all species that have ever existed gone extinct? Perhaps you can enlighten us as to how "God did it" explains these observations? Oh, that's right. You're among the many here asserting that this is unknowable. As such, you're the one who's excluding God from the process. Neal: Evolution is a superstition wrapped in scientific sounding buzz words that have little actual explanatory value. The mechanisms of evolution are insufficient in their explanatory value and unrealistic in the powers that they credit nature with. You've essentially asserted the biological complexity we observe is beyond human reasoning and problem solving. Only the supernatural can explain is capable of such an explanation. However, in the same breath, you're also claiming that such an explanation unknowable, which disqualifies it as an explanation. Again, this simply doesn't add up. Furthermore Neal, isn't it odd that essentially 100% of evolution deniers just happen to also be theists? Surely this isn't because religious belief is the cause of anti-evolution sentiments, is it? The nearly 100% correlation must be a coincidence, mustn't it?) But on the other hand, those who accept evolution come from all sorts of religious backgrounds; over 40% of scientists are professing believers of some sort or another. If religious/anti-religious sentiment were driving acceptance of evolution (as Cornelius likes to claim) what are we to make of the religious diversity in the evolution crowd, and the very distinct lack of religious diversity in the anti-evolution crowd? Another coincidence? And of the Christians who do accept evolution, do you think they are on average more, or less educated than their brothers and sisters who don't accept evolution? Care to take a guess? Is that a coincidence as well? Isn't it also odd that of people who go from belief to unbelief, It seems to usually be the case that acceptance of evolution comes first, then the unbelief? Wouldn't one expect it to be exactly the other way around if the anti-religious sentiment were driving acceptance of evolution? And of people who accept evolution and go from unbelief to belief, isn't it odd that they usually either don't stop accepting evolution (Francis Collins is a good example) or if they do, the do so only after realizing that evolution conflicts with their newly acquired worldview? Norm said "The mechanisms of evolution are well studied and verified. There have been numerous research programs that have verified that natural selection is a real process that occurs in nature (e.g. the Grant's meticulous study of Galapagos finches). There have been many studies confirming the importance of genetic mutation as the source of variation upon which natural selection acts** (e.g. Lenski's ongoing research with E. coli)." The problem has never been about whether natural selection or mutation are real. The problem is that these mechanisms are insufficient. If anything the finch beaks and E. Coli show my conclusion better. The finch beaks varied in size- yes -- but they returned to their previous size after the weather pattern changed. Calmodulin is the switch that turns on genes involved in increasing beak length. Nothing new and fancy there, just the kind of change that no one (yawn) debates. E. Coli is more interesting because of the tens of thousands of generations and trillions of these little critters that can be observed. I think this shows the practical limits to what mutation/natural selection can actually do. So you have observations of small changes, an assumption that the same mechanisms produce large scale change and innovation, and a contradictory historical record. Derick, I became a Christian after seeing that evolution was not science but superstition. I tested through second year college science credits right out high school and went on to graduate with a bachelors of science. After 30 years of studying the pros and cons of evolution and creation I'm more convinced of my position as ever. Your theory regarding the relationship between education/evolution is interesting, but such arguments add zero support to the soundness of the theory, but they are interesting. Critics of evolution are found in the highest levels of scientific academia. CH raises many questions that you guys mostly dance around and then you wonder why most people still don't accept evolution. Can a perfectly good God create suffering? That seems to be the crux of the matter. Wimps like evolution and theologians so no. God is all powerful, good, and all knowing. He wouldn't make us suffer, would he? end of analysis. However, if you have the guts to objectively think about this issue then you can come to a reasonable understanding. If you were an extremely power creator like God which would you prefer: a) creating two people for all of time or b) hundreds of billions. I think an extremely powerful, intelligent God who interacted personally with all of His creations would prefer the latter. I think the former would get boring pretty fast for an intelligence like God. Therefore death is necessary. Wimps, evolutionary and theological, take a reality pill. It is God's design. Death is built into the system for God's pleasure. You are not Gods. You will not live forever. You are not that important, God is. God does grant eternal life, but not in this world. I think the former would get boring pretty fast for an intelligence like God. Therefore death is necessary. Wimps, evolutionary and theological, take a reality pill. It is God's design. Death is built into the system for God's pleasure. Right on, Peter. The Abrahamic god is a sadistic monster, made in the image of sadistic monsters. Those are good questions, but they are theological ones, not scientific. Of course those are theological questions. The thinking behind my question is this. Many evolutionists use theological arguments to discredit the arguments of creationists and ID folks: the imperfect designs we find in nature aren't befitting an omniscient, all-powerful God, so evolution must be true. Their theological arguments in a way are imposing rules on the way nature should work; it should work without the intervention of a God, because a loving God wouldn't intentionally design an evil organism. ID theorists, on the other hand, accept design in nature, and therefore conclude that this is how nature does work. In so doing, they are confronted with those "evil" designs. Those evil designs must be reconciled with their understanding of a beneficent, loving God. But is reconciliation the only option? What if nature is telling us something about the designer that may lead us to the conclusion that the designer is not God? Does that mean there were actually at least two Designers, working at cross purposes? So, yes I am open to the possibility that there may be two designers. But I am getting into territory that is way beyond my ability to discuss intelligently; I am merely asking some questions that have crossed my mind. Derick: Neal, did you ever stop and think how odd it is that you're smarter than 99.9 percent of all professional biologists? (and around 98 percent of all other scientists?) I mean, to not see that evolution is just a superstition, these guys must be complete idiots. Rather than thinking he's "smarter", it's likely Neal think's he better informed. Like all Christians, Neal supposedly has access to heavenly secretes which make sense out of earthly realities. This includes the observation that good things happen to some people, but not others, suffering, our eventual death, etc. …because it does not help Neal answer the question he's asking. But this is NOT the question that evolutionary theory addresses. The problem is that it's tangential to the question Neal is asking. It's a problem because it assumes the biological complexity we observe can be explained using human reasoning and problem solving, just like everything else. Paul: Can a perfectly good God create suffering? Can we be 100% certain that such a being does not exist? No, we cannot. However, this does not prevent us from pointing out this is NOT an explanation. It's an appeal to a possibility. At which point we discard it as it's indefensable as an explanation of anything in particular, let alone the biological complexity we observe. This is not to say that an explanation for intelligent design could be provided, but I do not expect one to be forthcoming for reasons which are obvious. The designer is supernatural, which represses a boundary where human reasoning and problem solving supposedly cannot pass. Paul: However, if you have the guts to objectively think about this issue then you can come to a reasonable understanding. If you were an extremely power creator like God which would you prefer: a) creating two people for all of time or b) hundreds of billions. I think an extremely powerful, intelligent God who interacted personally with all of His creations would prefer the latter. I think the former would get boring pretty fast for an intelligence like God. Therefore death is necessary. Paul, I'm not folioing you. It's unclear why death would be necessary for God to have a relationship with a hundred billion people. God could have created hundreds of thousands of habitual planets which hold billions of people. If God is an immaterial being that exists out side of time and space, but can still have relationship with us here on earth, it's unclear why these people would need to be specially located together on a single planet. Do we even need to exist in a physical universe to have a relationship with God? If we have such a relationship in heaven, then it's unclear why a physical universe is even necessary, which is another solution to the population problem. Furthermore, why would an infinite father stop at 100 billion when he could have a relationship with an infinite number of children? When Jesus returns, this will end procreation. There will be no more births. Wouldn't' God "get bored?" If there are births heaven, then what is the purpose of being born here, rather than in heaven? In other words, that death is necessary to prevent God from being "bored" simply doesn't follow. Rather, it seems like an appeal to the possibility that we cannot know such a state of affairs does not exist with 100% certainly. What is your basis for saying I surrendered the moral high ground? And what is your basis for saying anything is moral or immoral? What is your basis for saying morality even exists? That was the point of my post. I get the impression that you are actually agreeing with me. And why is "We don't know much about orgins, but we hope to discover an answer in the lab someday" more logical than "Theists have been studying the problem of evil for millenia, and we have some good ideas?" Or why is it more logical than "When the Messiah arrives or Jesus returns or the Imam shows up we will have an answer?" I admit that it is more intellectually satisfying to a person who likes science, but that doesn't make it any more logical. Neal Tedford: Even now Zachriel while not dispensing with his nested hierachy refrain altogether, now qualifies it with "exceptions". Your inability to comprehend the nested hierarchy, or to follow a step-by-step explanation, is not an argument. An indicator of your confusion is that you think our position has changed. Here is a typical comment from 2007. Joe: Nested Hierarchy is a prediction of the theory of evolution- pro & con- that would include ALL living organisms. Zachriel: I would have to take the *con*. The Nested Hierarchy does not apply to "ALL living organisms." It is observed primarily in eukaryotes, and even then, there are substantial exceptions, e.g. Plants are notorious hybridizers, though the nested hierarchy can still be discerned, bacteria exchange and absorb genes freely, viruses infect genomes, etc. Neal Tedford: Nothing new and fancy there, just the kind of change that no one (yawn) debates. Just the sort of changes that changed one finch species into more than a dozen, evolving to occupy the finch, warbler, woodpecker, ground, tree, leaf-, seed-, bud-, insect-, blood-, grub-eating and tool-wielding niches. Thinking capabilities consistent with a evolutionists. God gave us life and all the pleasure therein. We are in the wealthiest period of history, and yet God is sadistic. God gives us eternal life, and heaven to the faithful and obedient. I guess this is not good enough for pendant. He wants to be given everything without returning a thing. If his brain does not have to stretch and conceive of a being outside of space-time then all the better. He obviously has not felt the joy of parenting or he would realize how foolish his comments are. The fact that the wasp 'knows' what non essential organs to eat is a true mystery...a blind, unknowing creature, capable of devouring the insides of a creature so as to keep it alive...now, what does that suggest? 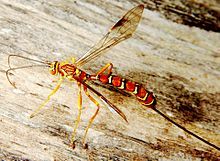 Is it true that the ichneumonoidea wasp evolved from former politicians. Was the Snake in the Garden of Eden a parasite? 14 In the Garden, according to a tradition. Now he was some snake. 5 Genesis 2:23 Emphasis on THIS IS NOW. I can't get no, I can't get no. Now you know why the Rolling Stones are into Kabbalah. Does Religious Belief Drive Evolution Skepticism? Anthropomorphic Terminology: Obstacle or Enabler?